SERIOUS Investing: IHH IPO: Will Khazanah need to pull the rabbit out of the hat? IHH IPO: Will Khazanah need to pull the rabbit out of the hat? Private healthcare is great and a fast growing business especially when you consider that many nations in this world are greying. As a result, it may not be that difficult to sell an IPO of supposedly the second largest private hospital group in the world. At this moment, there is yet to be any conclusion on what will the market value be for the IPO, however indication from the Managing Director of Khazanah is that it will be slightly smaller than Felda's IPO. Since Felda is valued at around RM16.6 billion, would RM15 billion be close to the mark? In fact, the latest apparently, IHH is to be valued in excess of RM20 billion. First of all, how does Khazanah get into owning so many hospitals so fast? Started off with a controlling stake in Pantai Hospital Group when there were complaints of Parkway acquiring strategic hospital assets in Malaysia. As a result, Khazanah was used to purchase an effective 60% stake of Pantai Hospitals from Parkway. Hence Khazanah started off with owning all the Pantai(s) in Malaysia. Instead of just expanding its list of private hospitals in Malaysia, Khazanah started to accrue many more hospitals overseas hence turning itself into the 2nd largest group. In its acquisition of Parkway in Singapore, Khazanah had to fend off controlling ownership and later buyoff the Group from the Fortis Group of India. Price: USD3.3billion (RM10.56 billion) at valuation of 39x PE based on Parkway's financial results for 2009. 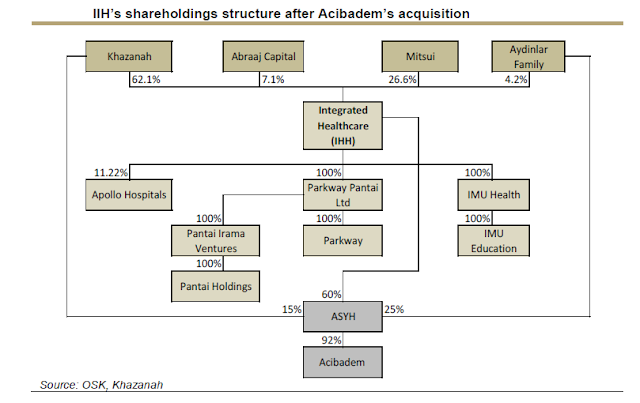 Latest round of acquisition, the IHH group under Khazanah bought into 60% of Acibadem group at valuation of between USD1.1 billion to RM1.68 billion depending on which group they bought from. Based on my calculation, the valuation on Acibadem is in excess of 15x EBITDA and more than 100x PE. Even if it is calculated at Price / Book Value it is more than 14x book value. On top of that, Khazanah already owns 12.2% of Apollo Hospitals which it acquired as an investment in 2005. Hence, despite Khazanah managed to accumulate that many hospitals, it is at the expense of very high price being paid for these assets. Although the proforma financials for IHH is not yet available, based on my estimation from past financials here are possible contributions from each. If that number is close to accurate, I would think to achieve market valuation of around RM20 billion, Khazanah will be selling this IPO at not less than 40x historical PE, which is very little room for valuation growth. At that price, I think the national investment arm will have a hard time looking for takers especially at a time when many companies are postponing IPOs. I hope I am wrong for this one! 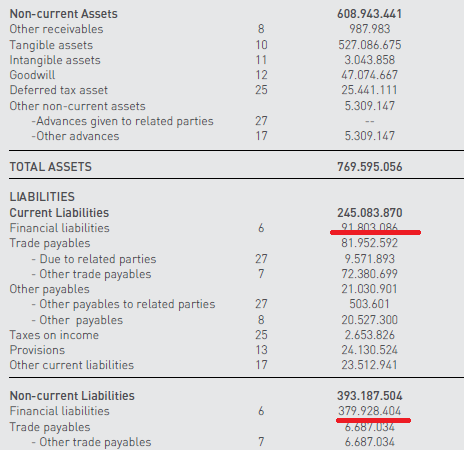 Anyway, is the term 2nd largest misleading as it only owns 12.2% of Apollo? Despite all the positiveness, the business of private healthcare which has a great advantage i.e. its pricing inelasticity is facing greater competition in future. I still like the IHH private healthcare group though as a business but the issue here is price. Frankly, I do not see the need to rush this IPO. If Khazanah is not valuing the IPO at in excess of RM15 billion, why do they need to let go part of the group at a lower price especially when the purchases were made at a high price. They could have waited it out and do the IPO by 2013 or 2014. I do not believe this is a political IPO either unlike the Felda IPO which they need to be quick.